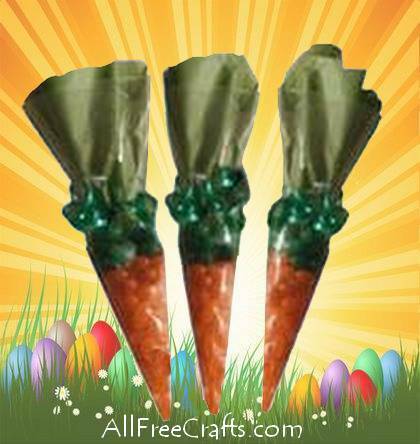 Jelly Bean Easter Carrots are sure to be popular with your kids, as well as the Easter bunny. You can make these colorful jelly bean carrots very quickly, but they have such a bright, springtime appeal that you can be sure they will please everyone on your Easter list. Pile Easter grass inside a shiny metal colander and nestle the jelly bean carrots inside to use as a unique Easter table centerpiece, or hide them (if you can) as unusual finds in your Easter egg hunt. You could offer one of these jelly bean carrots as a winning prize in an Easter game, or tie a few together as a bunch of carrots to decorate your door or wall instead of a wreath. The same bunch of carrots could then be the focus of a “guess the number of jelly beans” game. Who knew carrots could be such fun? 1. Fill the bag about half full with orange jelly beans. Add a layer of green jelly beans. Prop the bag inside a narrow vase or wine glass to hold it up while you work on the next steps. 2. Cut a strip of folded green tissue paper that is a little wider than the length now available from the top of the green jelly beans to the edge of the bag. Make sure the double-layered tissue paper strip is long enough to roll easily into a loose circle that will fit nicely inside the top of the bag. A generous overlap when you slide the ends of the circle together is fine and will add a little body to the top of the carrot. 3. Roll the tissue paper strip loosely and fit it inside the bag, pushing it down to meet the top layer of green jelly beans. 4. Tie one or two strands of curling ribbon around the bag, just above the green jelly beans, so that the ribbon cinches the bag tightly and holds the tissue paper in place. 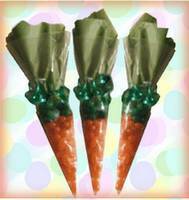 — Fill the carrot with other orange colored candy, or with cheese puffs, and top with a layer of green easter grass. — Omit the green jelly beans, if you don’t have them, and rely on the green tissue paper to provide the carrot’s greenery at the top.